We are delighted to inform our users that we have now taken delivery of and verified a random access Nucleic-Acid-Amplification-Test platform, called EliTech. This will replace the current referred service in Bristol and will give much better turnaround times (currently 2-3 days, down to a next day result). We really hope this will have a good impact on patient care, allowing speedier diagnosis and decision making, and limit the amount of intravenous acyclovir currently being used whilst waiting for results. 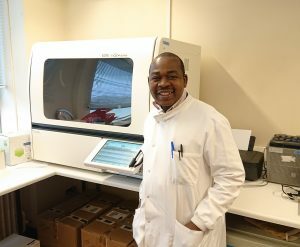 Exeter Clinical Laboratory International are an NHS laboratory located at the Royal Devon and Exeter Hospital in the United Kingdom.